A tattooed motorcycle enthusiast is no typical banker. Marwan Arakji worked at Bank Audi for over two decades before quitting his corporate career late last year in favor of a job as COO of Ubanquity Systems, an Ireland-based FinTech startup expanding across the region. Why did you shift careers? My last position was Deputy Head of Group Retail but I decided to go into digital banking solutions and application. Banking as we know it is being disrupted globally, facing fierce competition from FinTechs. Now I’m in a place where I can explore the future of financial services on a large scale. Ubanquity develops and manages banking solutions – all things digital. I work twice as hard but I’m twice as happy, I just wish I was 15 years younger. How has your style changed since the switch? I’ve been wearing suits since I graduated – until this year. I still wear suits with clients, otherwise I’m casual and much happier. One was designed by my best friend for five of his closest friends. The other bracelet is Harley Davidson. It was first developed with Jacques Cousteau in the 1970s. I love the shape, which is based on mechanics and function, not design. It’s a diving watch so the strap is inspired by anti-shark diving suits. Boots are safer for riding, in case you fall down. It’s function not a fashion statement. 13. I tried to get my first tattoo – the cover of The Alan Parsons Project “Eye in the Sky” album – at 3 a.m. on Sunset Boulevard in my early twenties. The artist refused so I came back the next morning. My favorite is the helmet of racer Valentino Rossi, it’s one of my biggest tattoos and took nine hours. I like getting tattoos in places I visit, like souvenirs. In Mykonos an old biker who rode through Lebanon in the 1960s tattooed me. How long have you been a biker? I was 12 when I first rode a friend’s brand new motorcycle, and I crashed it. After that I wasn’t allowed but I always had this fantasy of owning one. I got my first Harley in 1996 and now I have five, plus three other bikes. My wife parks her car outside because there’s no room for it in the garage. It’s not a mode of transportation or a hobby, it’s a passion. Every year I do the Lebanon tour organized by the local Harley Davidson dealer and H.O.G. 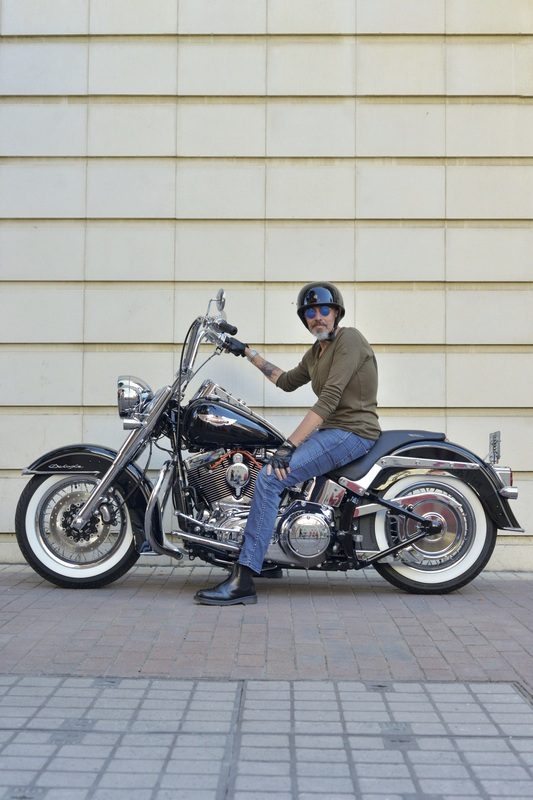 (Harely-Davidson Owners Group) chapter, and I’m very involved in Lebanon and the region.